September 2, 1977, was kinda rainy. My friend, Stan, and I spent part of the bicycle ride that day riding “tail,” which meant we agreed to be the last of the many riders. That way, when the repair truck or sag wagon got to us, the driver knew they could turn around in their multiple trips back and forth to ensure all DALMAC riders were serviced as needed. So, I was among the last of the riders that day. And with only about two miles yet to go to where we all set up camp, I remember riding over a set of railroad tracks. The next thing I remember was waking up about a week later in a hospital. I had been hit by a drunk driver. And it was bad. I can’t believe I’m here talking to you. I can’t believe you’re standing here. I’m a paramedic and I saw you get hit. I just happen to be driving on that road and I saw you get hit. By the time that I pulled over to see if I could help, the three people in front of you were hit. You need to understand my training. I need to tell you. I did not help you. All I did was move your head because you were face down in a puddle. Then I went to help the others. You have to understand my training. Triage tells us to help those who will live. I’m sorry but I really don’t owe you an apology. There was no way you were going to make it. I get it. It makes sense. I told you it was bad. So bad, in fact, that the ride’s organizers, knowing my dire condition and presumed destiny, announced to the other riders that evening that I had died. Several years after “the accident,” I was on a blind date and as we shared all the usual introductory banter, I told her that I went on occasional bicycle tours. “Have you ever been on DALMAC?” she asked. Well, sure. “Were you on it the year that guy died?” Yep. I’m the guy. Three days in a coma. Four months in the hospital. When both your tibia and fibula are fractured, there is nothing to keep your leg muscles from contracting. I lost four inches in my left leg. Messed up on the side of the road on a rainy day? My bone infection required so many antibiotics, that for months after my hospitalization, my sister and roommate were giving me injections twice daily. My collar bone was broken in some ball-and-joint way that precluded a cast. My shoulder movement would be limited for the rest of my life. Did you know that it was not uncommon in 1977 to go on bicycle tours without a helmet? Yep. So, my head was pretty scarred up and the concussion / Dilantin drugs kept life pretty fuzzy for a while. But I’m a lucky guy. Dr. Lanny Johnson, the orthopedic surgeon, lengthened that left leg back out to about a half inch of where it should be. Whenever I buy shoes, I get a half inch of extra sole added to the left one. Few people notice. The bone infection went dormant and has remained so for forty years. At the airport, when the TSA agent tells me to raise my arms above my head, they don’t really care that my left shoulder refuses to cooperate. I’m a lucky guy. But why? They say, “Well, I guess it just wasn’t your time.” Or, “God must have wanted you around because He had a purpose for you.” I don’t know. I don’t know how the universe works. Maybe this story belongs under the “Faith” category of my blog. Though I do not stay awake nights developing my theology, I am a faithful person. I believe in both God and science. Science says the universe probably began with the Big Bang. The Bible tells us it was created. Same thing. I believe in ghosts and spirits. Do I understand how they work? Nope. But I believe that I have a spirit and you have a spirit. When my physical body gives up, my spirit will go on. Will it go to heaven? Well, I’m not really sure what that is, but I hope so. There are universal truths. Murder is bad. Kindness and love are good. Those to whom much is given, much is required. I lived through a bad accident. Much was given to me. I pray that I am living a life of appreciation for all that has been given me. That I am giving back. That I have accepted the grace that was so freely offered. The Republicans have this war against working people and they mostly fail to understand American economics 101 and yet their campaigns blaming your problems on “the other guy” seem to keep working. You probably know that our economy depends on the flow of money. We need to buy things to keep the economy going. Working people do that. For the most part, the rich that contribute so much to the Republican Party don’t. When you get a raise, you buy food, you buy school supplies, you buy cars and you pay your taxes on it. When corporate and owner profits increase, they hide it in foreign banks. They do not spend it. They do not pay taxes on it. It does not trickle down. Being against a raise in the minimum wage, being against union wages, being against living wages may be good for the economies of the Swiss and Cayman Island banks, but it is not good for America. The WPA worked. The stimulus worked. Getting money into the hands of working people is good. The Obama administration has grown the economy such that there has been a dramatic increase in the number of private sector jobs. This would have been helped if the Republican legislature had also passed one or two jobs bills, but they refused. Working people with money spend it and the economy grows. The people in the legislature aren’t stupid. They know that. But working people don’t add enough to their campaign coffers to get their attention. This next election, don’t vote for the candidates paid for by corporations. Vote for the candidates who grow the economy by placing more money in the hands of workers. The economy isn’t being stalled by the poor immigrant picking strawberries, it is being stalled by the flag waving Republican congressman funded by Nestle, Monsanto and the Koch brothers. To my conservative Facebook friends: We have disagreements. That’s okay. But please get off the Fox News hate train. Not all Muslims are your enemy. The President of the United States is not your enemy. Not all people needing unemployment and welfare are deadbeats. Not all minimum wage workers are dumbass idiots. Income equality is currently at the worst point almost ever. The rich people who inherited their wealth tell you that poor people are lazy, that keeping the minimum wage low and keeping poor people poor is good for you. It’s not. We need to lift up our brothers and sisters. They continually imply that there is a multitude of black teens out there who are lazy, dangerous thugs in hoodies and if they get shot, they deserved it. No questions asked. If you believe that, please unfriend me now. Fox News does not want you to notice the massive income equality between you and rich people. Instead, concentrate on hating Muslims and immigrants and liberals and welfare cheats. Please. I beg you. Get off the Fox News hate train. You do know, don’t you, that we accounting types are totally bewildered by the rest of you. I’ve come to accept that some of you don’t balance your checkbooks every other day, and realized long ago that not many of you, when you go down a flight of stairs, are counting them off to yourself. But today, our office manager confided to me that she’s okay with the file folders being boxed with tab positions all grouped together. That’s hard to accept. And, frankly, I suspect that some you guys working out at the gym are not counting your reps and sets. But don’t tell me. I don’t want to know. But, c’mon. It’s sunny and, yes, a little nippy. But it’s Winter. And here in Michigan, we also have Spring and Summer and Autumn. I still very much love Michigan! I have decided to stick with love. Hate is too great a burden to bear. — Dr. Martin Luther King, Jr. In fall of 2013, I finally faced the fact that a New Year’s resolution to work out more is ridiculous. It can’t be a diet or this year’s fitness regimen. It has to be your lifestyle. 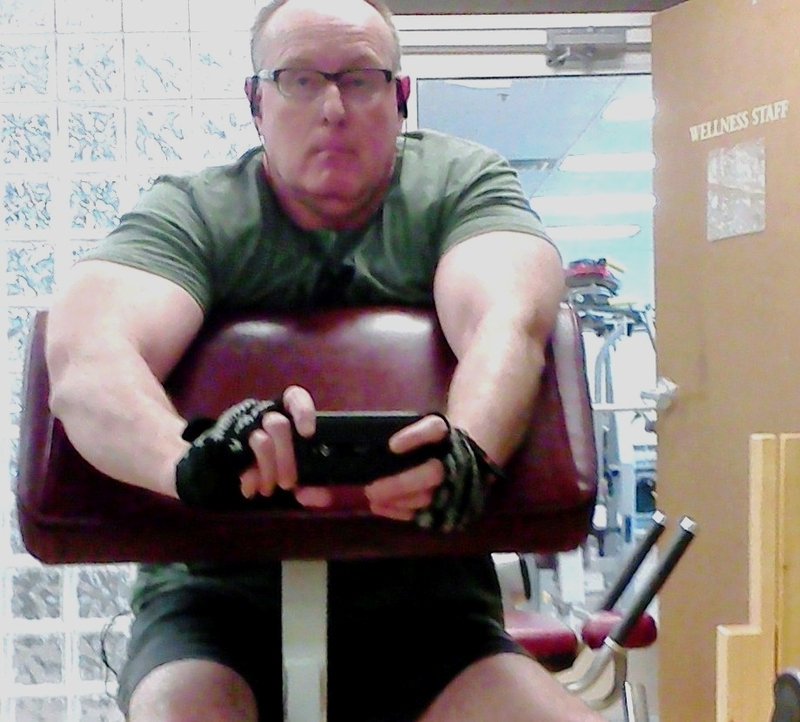 So, while this pic was taken on January 4, 2014, it is not to show you that I am keeping a New Year’s resolution. It is to show that I hit the gym several times a week because that is my lifestyle. And (may I say) not a bad one at that.